If you’ve never gone storm chasing, you are probably wondering why the hell anyone would willing jump in a car and race towards a tornado. Of course, this is in opposition to ducking for shelter like all the sane people are told to do. Sure there’s the thrill of the chase and the glory to be had in getting the best documentation on the sheer magnitude of this weather phenomenon, but it is common knowledge that can be extraordinarily dangerous for anyone who dares to try. Even so, every tornado season people who are fascinated with meteorology, but in particular the study of these storms, load up their cars with tracking gear and go hunting for the severe weather that send the rest of us running for cover. He’s the owner of Central Oklahoma Stormchasers and has professionally chased storms for the past 5 years. In that time he’s documented many tornadoes and other severe weather phenomena. In 2010 he hired Shane Carmack to assist as driver. Carmack said he moved to Oklahoma several years ago and had always been interested in weather. He and Mcbee became friends and decided to start chasing together. To pay for some of the operating cost, Central OK Storms has licensed their images and videos to PBS’s NOVA as well as other media outlets. Mcbee said most of the income they generate from storm chasing goes toward equipment and vehicle enhancements. He said there’s always new and better equipment. He also participates in Chaser Con, which McBee says occurs every year in Denver, Co., and has driven outside the state more than once to chase storms. 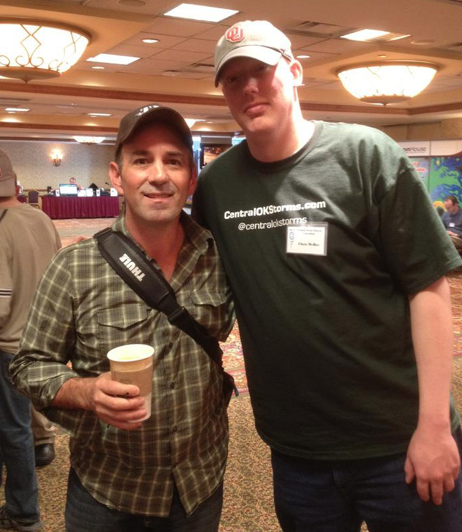 Left to right - Sean Casey and Chris McBee at ChaserCon 2012 in Denver. Casey made an IMAX film called "Tornado Alley" which is being shown in museums and science centers around the world. McBee was willing to let OKC.NET ride with him, so during the weekend of April 13th-14th we asked cameraman Andy Gomez to go out and document the storm chasers. To be frank, a lot of our other staff were a little bit jealous that Andy got the assignment to go ride out with Chris and his crew. It’s clear that the prospect of danger gets us easily excited too. That said, McBee runs his business like any thoughtful owner would. Anyone who rides with him is given a waiver to sign and usually has a job assigned to them. With Central Oklahoma Stormchasers there are no free rides. Tagged Andy Gomez, Central Oklahoma Stormchasers, Chaser Con, cs, IMAX, NET, OKC, Shane Carmack, Texas Panhandle, Tornado Alley. Bookmark the permalink.